It is an artist’s privilege and curse to have the opportunity to render the horrific beautiful. Privilege because it is an opportunity to illuminate and to express even in the face of the soul-crushing, curse because it requires the artist to stare into an abyss that we can never be sure isn’t staring back. I am not referring to sugar-coating, the act of softening the physical and emotional impact of something truly painful. I am also not glorifying the terrible or suggesting that some abstract “goodness” is inherently present in the otherwise devastating. What I am saying is that artists can create and give voice to our living nightmares, and that such a thing can be truly beautiful. 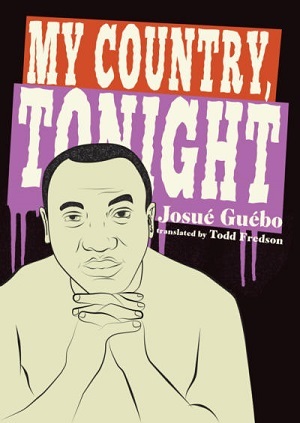 Case in point: My country, tonight, by Josué Guébo. This small collection of poetry, translated by Todd Fredson, is an exercise in brazen catharsis, a squaring of the shoulders to confront the pain and the rage and the wounds at the feet of exploitative oppressors. As Fredson points out in his eloquent introduction, Guébo’s home nation of Ivory Coast has been rocked with political instability and infighting, the most recent of which has resulted in two civil wars in less than fifteen years, and which stems largely from the gross callousness and cruelty of French colonization. This is a background that should not be unfamiliar to the modern day children of colonized peoples or students of history. Guébo’s portrayal of violence and suffering and their resulting confusion and questions echo voices like those of Achebe and Marquez as he demands to know what the hell the point of all of it was. Where My country stands on its own powerful legs is in its fire and its drive. This is the voice of someone who knows the names of the dead and the broken and whose resistance is coalescing before our very eyes. This is an identity taking shape, a concept and a thing made out of some original template but which has taken on the congealed elements of circumstance, like the blood of the fallen. That identity absorbs the impact of the “words” and the “fee”, embracing the disfiguration such things carry with them and allowing them to expedite the rebirth. Using this passion, Guébo speaks with his own voice and with the voice of his people throughout the collection, making it near impossible to distinguish between the two. His poetry works on more layers than I can easily keep track of, equal parts call to action, funeral song, legal injunction, and existential narrative. It exists beyond a simple documentation of the injustices done to his people. Each page of poetry can be taken as its own separate poem or a continuation of the voice from the previous page. There is one speaker who is both an individual and a collective, which have vision over an entire nation and beyond, from the graveyards to bombed-out cities to empty homes to the whole of the continent. Every poem is charged like this, fueled by the “magma” behind the “laughter”. Reading this page after page is a draining, intense, unsettling experience that demands further attention. And that is in no small part due to the beauty of the language on display. To put it simply, Guébo has an elegant grasp of language and a clear desire to wield it. In the original French (which itself is heavily influenced by the local native language of Ivory Coast), the words flow as if written for melody, singing with sarcasm and a need for action. Fredson’s translation into English does the original plenty of justice, allowing the reader to experience a kind of harmonized duet where Guébo commands the lead. The last particular note I’d like to make is one that I have brought up many times in the past – the power of a good title. Like the poetry behind it, the title of My country, tonight works on more levels than are easily kept track of. Is the speaker of the title referring to imminent revolution, the taking back of a stolen homeland? Is the speaker worried about the tenuousness of his nation given the circling predators waiting to feed off of it? Is the title the opening of an address to a people, to the land itself, an address that seeks communion with a collective spirit that has long been ravaged? These are the gifts of great poetry, the marvelous ambiguity and the heady rush of perspective evolution. Guébo’s efforts here provide both in ample quantities while never getting distracted from his intent and message. It beautifully renders the horrific, letting us bask in the glow of its ravenous fire. My country, tonight is available now through Action Books.